(Nanowerk Spotlight) Nanostructures present novel material properties and interesting insight into new physical phenomena. However, from a technical and commercial application point of view, a successful bridging between the nanoscale specific significance with large-scale applications must be made to obtain these benefits. One of the 'hottest' nanomaterials at the moment is graphene, a one-atom thick sheet of carbon (see: "Nanotechnology researchers go ballistic over graphene"). Ribbons made from graphene, basically stripes that look like molecular chicken wire, show even more unconventional properties than graphene, especially when they are less than 100 nm wide. Any material approach to use graphene nanoribbons for larger-scale applications must be able to assemble them into macroscopic materials, while preserving their physical significance and novel properties at these larger scales. Researchers at MIT have addressed this issue by proposing hierarchical assemblies of graphene nanoribbons through hydrogen bonds, inspired by biological structures found in nature such as proteins and DNA macromolecules. Their work brings about a synergistic viewpoint that combines advances in materials development and insight gained from biological structures, and leads to new understanding of the mechanics and physics hydrogen bonds at the bio-nano interface. "Graphene nanoribbons possess fascinating electronic properties such as width and edge shape dependent electronic properties, which suggest flexible control of their properties through structural modification," Markus Buehler tells Nanowerk. "However, the lack of precision control at the nanoscale, the structural instability at elevated temperature, and the chemical activity at their open edges have provided great difficulties in achieving larger-scale applications of graphene nano-ribbons so far." In recent work ("Hierarchical graphene nanoribbon assemblies feature unique electronic and mechanical properties"), Buehler, the Esther and Harold E. Edgerton Associate Professor at MIT's Department of Civil and Environmental Engineering, together with his postdoctoral associate Zhiping Xu, have investigated the mechanical and electronic properties of graphene nanoribbons through first principles calculations. They demonstrate that hierarchical graphene nanoribbons not only preserve the unique electronic properties of individual graphene nanoribbons in the bulk, but are also energetically and mechanically stable. "The selective and directional binding of hydrogen bond enables the design and synthesis of graphene nanoribbon materials of scalable size, linking nano to macro," explains Buehler. "Moreover, the hydrogen bond network provides considerable structure stability with respect to both tensile and shear loads." 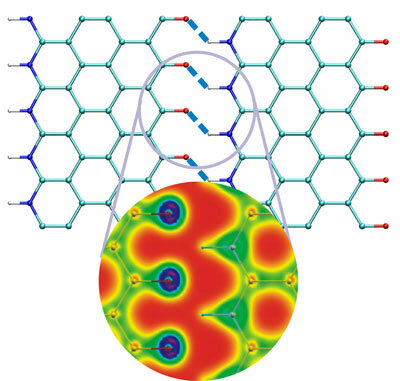 In their work, which was funded by DARPA and the MIT Energy Initiative (MITEI), Buehler and Xu show that the weak nature of the hydrogen bond preserves the intrinsic electronic properties of graphene nanoribbons in the assemblies. Specifically, they confirmed that the edge states are observed near the Fermi level and the electronic structures are controllable by the width of graphene nanoribbon. The MIT researchers utilized a bottom-up atomistic simulation approach, based on first principles calculations. They have performed a series of simulations to examine the functional properties of hierarchical structures of graphene nanoribbons with different geometries. Based on their simulations, they propose larger-scale hydrogen bonded assemblies based on functionalized graphene nano-ribbons, with -C=O group functionalization and -N=H substitution at the edge (see Figure above). These results show, for the first time, how functional large-scale nanostructured materials made of hierarchically assembled graphene nanoribbons can be fabricated. A lot of Buehler's research deals with examining and explaining structural hierarchies in biological materials and applying these findings to the design of novel materials (see for instance: "Insight into nature's protein factory could lead to radically new materials design "). So it is not surprising that his new approach to scaling up graphene nanostructures – which can also be extended to other nanostructures – is also bioinspired. "Our results provide the scientific basis for broad impact in developing novel functional materials with exceptional controllability at the nanoscale" says Buehler. "The hydrogen bond based assembly is a major breakthrough for the design application of graphene nanomaterials and offers a roadmap for the experimental work in this direction."